For the International Year of Biodiversity in 2010, the Canadian Environmental Network launched a Best Practices/Case Studies Contest to gather innovative and effective examples of environmental nongovernmental organizations' (ENGOs) work related to the conservation, sustainable use, and awareness of biodiversity. One best practices/case study from each province and territory from across Canada was to be included in the Pan-Canadian Biodiversity Handbook, a 20-page handbook to be included as an annex to Canada's Fourth National Report to the Convention on Biological Diversity in preparation of the 10th meeting of the Parties to the Convention from October 18-29, 2010 in Nagoya, Japan. PCAP was selected as the Saskatchewan example. The handbook will be posted on the Canadian Environmental Network (RCEN) website and distributed to Environment Canada and the Secretariat of the UN Convention on Biological Diversity. On Tuesday, June 23, 2009, the Saskatchewan Prairie Conservation Action Plan's (PCAP) 26 partners renewed their commitment for prairie conservation at a signing ceremony held at the Royal Saskatchewan Museum in Regina, SK. The 2009-2013 PCAP Framework marks the third consecutive five-year plan signed by the PCAP Partnership. "It is an outstanding achievement that in Saskatchewan we have conservation groups working in partnership with farmers, ranchers and government," says Ray McDougald, PCAP Chair. "The formal PCAP Partnership has been going strong for 11 years and will continue into the future to bring awareness of the value of native prairie to Saskatchewan residents and beyond." The 2009-2013 PCAP Framework, upon which annual action plans will be built over the next five years, is a new approach by the Partnership that sets out a renewed Vision, Mission and Guiding Principles for the Partnership including three goals and five priority focus areas. The 8th Prairie Conservation & Endangered Species Conference (PCESC) is being hosted in Regina from March 1-3, 2007 (see Proceedings). The theme is Homes of the Range: Conservation in Working Prairie Landscapes. 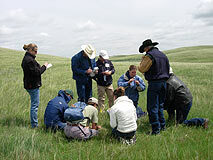 The Conference provides a forum for people involved in conservation to share information and consider new approaches to conservation and protection of prairie ecosystems and native species. Registration for the 8th PCESC is open to anyone with an interest in prairie landscapes, says PCAP Manager, Karyn Scalise. Those who have attended these conferences in the past decades, as well as people who are new to this conference are welcome to attend! Full biographies of all the speakers, as well as full program details and schedules are available at www.pcesc.ca/program. Agriculture and Food Minister Mark Wartman and Environment Minister Jon Nilson have jointly proclaimed June 18th - 24th, 2006 as Native Prairie Appreciation Week (NPAW). NPAW is an opportunity for the Saskatchewan public, especially ranchers, naturalists, hunters, educators and resource agency specialists, to celebrate the diverse values of native prairie. Saskatchewan is the only province in Canada with a week dedicated to raising awareness and appreciation of native prairie, one of the most endangered ecosystems in Canada. 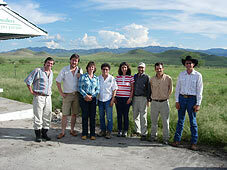 Chihuahua and PCAP Partners in Mexico. Photo by PCAP. In a gala ceremony held Friday, October 7, 2005 in Chihuahua City, Mexico, a new letter of intent to conserve the grasslands of Chihuahua state was unveiled. Modeled on the very successful Saskatchewan PCAP Partnership, the agreement calls for the development of an action plan to protect the grasslands of Chihuahua, and as such it is a very impressive step towards protecting several key Chihuahua Desert portfolio sites within the state. The signatories to the agreement included the governor of Chihuahua, The Nature Conservancy, the World Wildlife Fund, Pronatura Noreste, Profuana, INIFAP (the Mexican counterpart to the NRCS), the University of Chihuahua, and, importantly, the Chihuahua Cattleman's Association. The Saskatchewan PCAP Partnership was awarded the Countryside Canada Award at the 7th Prairie Conservation and Endangered Species Conference in Calgary. The award recognizes accomplishments related to the Saskatchewan PCAP 1998-2003 Action Plan. Countryside Canada is a national program designed to strengthen conservation practices within the agricultural sector through stewardship programs that promote best management practices and voluntary conservation efforts. The program is administered by Wildlife Habitat Canada in partnership with the Canadian Federation of Agriculture. A diversity of Partner groups renewed their commitment to native prairie conservation at a Signing Ceremony at the Royal Saskatchewan Museum in Regina on June 17, 2003. The Ceremony marked the launch of the 2003-2008 Prairie Conservation Action Plan, an action oriented plan focused on the conservation of native aquatic and terrestrial habitats within Saskatchewan's Prairie Ecozone. "The renewed Plan will not only guide native prairie conservation efforts in Saskatchewan, but will serve as a model for conservation planning across the North American Great Plains" says Dr. David Gauthier, Executive Director of the University of Regina's Canadian Plains Research Center. "The PCAP works because it promotes win-win benefits for livestock producers as well as conservation groups" says Allen Patkau, rancher and Chair of the SK PCAP. Needle and Thread was proclaimed as Saskatchewan's official grass species in 2001 under the provincial Honours and Emblems Act. Needle and Thread (Stipa comata) is a dominant grass of Saskatchewan's Mixed Grassland Ecoregion and is also common in other parts of the Prairie Ecozone. The Native Plant Society of Saskatchewan initiated the selection process in 1998 when it put forward Needle and Thread, Western Porcupine, and June Grass as potential candidates. The nomination was advanced by the Saskatchewan PCAP Partnership, who organized a vote among partner organizations to select the winning candidate. Saskatchewan was the first Canadian province to designate a native grass emblem, while Alberta soon followed in 2003 with the official designation of Rough Fescue (Festuca hallii) as their emblem.